In 1961, the Joint Congressional Atomic Energy Commission (AEC) approved Dairyland Power Cooperative's proposal to construct and operate Wisconsin's first nuclear-fueled power plant. This reactor was part of a pilot program to demonstrate the commercial feasibility of nuclear reactors for rural electric cooperatives and small utilities. 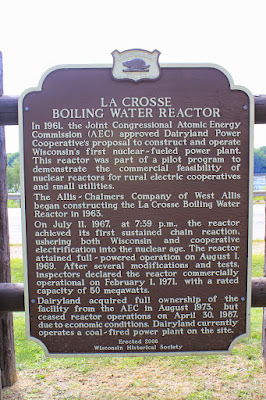 The Allis-Chalmers Company of West Allis began constructing the La Crosse Boiling Water Reactor in 1963. On July 11, 1967, at 7:39 p.m., the reactor achieved its first sustained chain reaction, ushering both Wisconsin and cooperative electrification into the nuclear age. The reactor attained full-powered operation on August 1, 1969. After several modifications and tests, inspectors declared the reactor commercially operational on February 1, 1971, with a rated capacity of 50 megawatts. Dairyland acquired full ownership of the facility from the AEC in August 1973, but ceased reactor operations on April 30, 1987, due to economic conditions. Dairyland currently operates a coal-fired power plant on this site. See also, Marker 76: Dams on the Mississippi, also at this location. Dairyland Power Cooperative in April of 1961, was designated by the Joint Congressional Atomic Energy Commission as eligible to construct and operate a nuclear-fueled electric power plant as a research and development pilot installation. 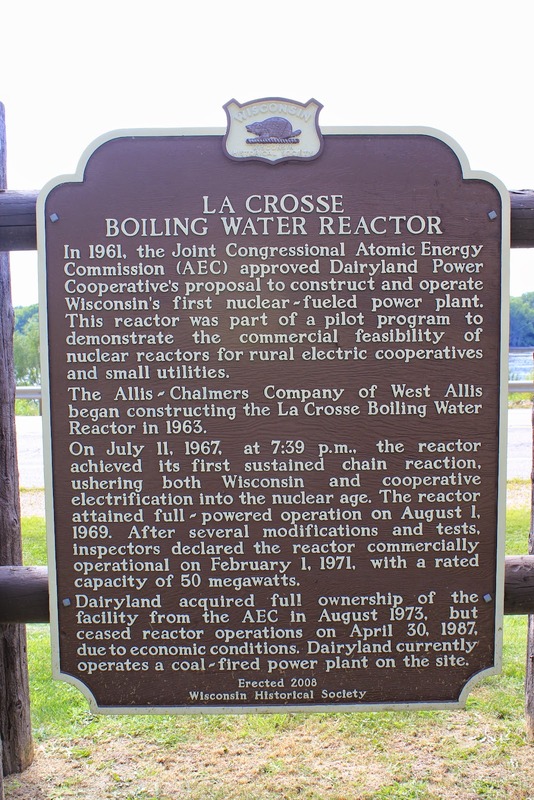 On June 8, 1962, the Atomic Energy Commission entered into a contract with the Allis-Chalmers Company of Milwaukee for the fabrication of a 50-megawatt facility, now identified as the La Crosse Boiling Water Reactor (LACBWR), and with Dairyland Power Cooperative for its eventual operation. Construction began in May of 1963. On July 11, 1967, at 7:39 in the evening, the reactor achieved its first self-sustaining chain reaction, which ushered Wisconsin into the nuclear age. Operation at full power level was attained on August 1, 1969. After several modifications and numerous tests, it was declared operational for commercial use on February 1, 1971, with a firm capacity of 50 megawatts. Dairyland Power Cooperative acquired full ownership of this nuclear-fueled electric generating facility by its purchase from the Atomic Energy Commission in August of 1973.